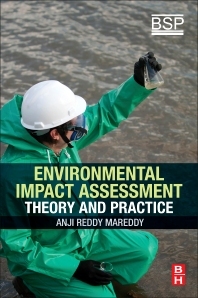 Environmental Impact Assessment: Theory and Practice describes the various pieces of knowledge necessary to speak the language of EIA and carry out EIAs focusing on a variety of environmental issues, including impacts on environmental components, like air, water, soils, land, noise and biological environments. Organized into 15 chapters, the book provides engineers with the tools and methods to conduct an effective assessment, including report preparations, design measures and relevant mitigation steps that can be taken to reduce or avoid negative effects. Case Studies are presented, providing guidance professionals can use to better understand, plan and prepare environmental impact assessments. Anji Reddy Mareddy is a Professor of Environmental Science and Technology, Centre for Environment, Jawaharlal Nehru Technological University Hyderabad (JNTUH) India. Dr. Reddy received his Ph.D. in Remote Sensing (Civil Engineering) from JNTUH in 1995, M.Tech. Civil Engineering from Indian Institute of Technology (IIT), Kanpur in 1989 and M.Sc. in Geology and Bachelor of Science (B.Sc.) from Andhra University, in 1986 and 1984 respectively. He has more than 24 years of teaching and research experience. Dr. Reddy’s research interests include environmental impact assessment methods and strategies, execution of operational EIA projects, environmental management, pollution source evaluation and environmental protection methods, remote sensing, GIS and GPS. He has guided 28 Ph.D. students, more than 160 M.Tech. students and executed more than 25 sponsored research projects. Dr.Reddy has published and presented more than 180 research papers. He also delivered number of lectures on these areas of research in national and international institutions. He authored textbooks, namely, Remote Sensing and Geographical Information System, Geoinformatics for Environmental Management, Digital Image Processing and Environmental Science and Technology and also edited the seven proceeding volumes of International Conference on Environmental Management. This book is his fifth textbook which is an outcome of six years of his experience as Chairman of Andhra Pradesh State Environmental Expert Appraisal Committee (SEAC) constituted by Ministry of Environment and Forests, Government of India with the recommendation of Government of Andhra Pradesh. He is also the author of number of research reports, book chapters, course material related to environmental studies. He has also written environmental statements and EIA reports on projects such as mineral extraction, power plants, cement industrial, roads, waste water treatment plants, industrial estates, parts and special economic zones and flood control banks etc. He is a technical member and auditor of World Bank funded projects, Coordinator of environmental geomatics, TIFAC-CORE (Centre of Relevance and Excellence), Department of Science and Technology, New Delhi. He is the National expert committee member for revival of village ponds project, Earth and environmental science expert committee for the empowerment of women, expert member of the project Kolleru lake restoration management plan of DST, expert working group member of hyper spectral signature data base creation project and village knowledge management system of NRDMS, DST. Awards received by him are Rotary Vocational Excellence Award 2009, AP SCIENTIST AWARD 2010 in recognition of outstanding services rendered in the area of environmental sciences and technology, EIA and environmental management systems. Best Teacher Award-2012 from Govt. of Andhra Pradesh and AP fellow of A.P. Academy of Sciences. For his outstanding contribution in environmental problem solving, pollution control, health and safety, GIS and Remote sensing applications for water quality, environmental planning and assessment, EIA, Socio-economic development through scientific means, he stood not only a distinguished professor in JNTU but also at national and international level.